If I had a nickel for all the bouquets of dandelions I have had the pleasure to receive from each of my 6 children, I would be a rich little Mumma. 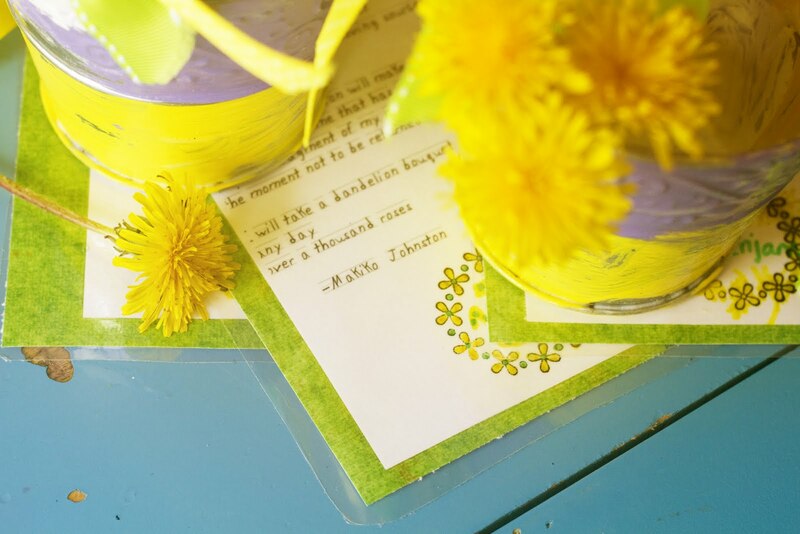 There is nothing like the start of the dandelion season. The little yellow blossoms start popping up all over the city. And while most people are cursing at them, I am smiling. First of all, what’s happier than yellow? And secondly, when else does a mother get flowers brought to them EVERY day of the week?? What’s not to like about this season?? 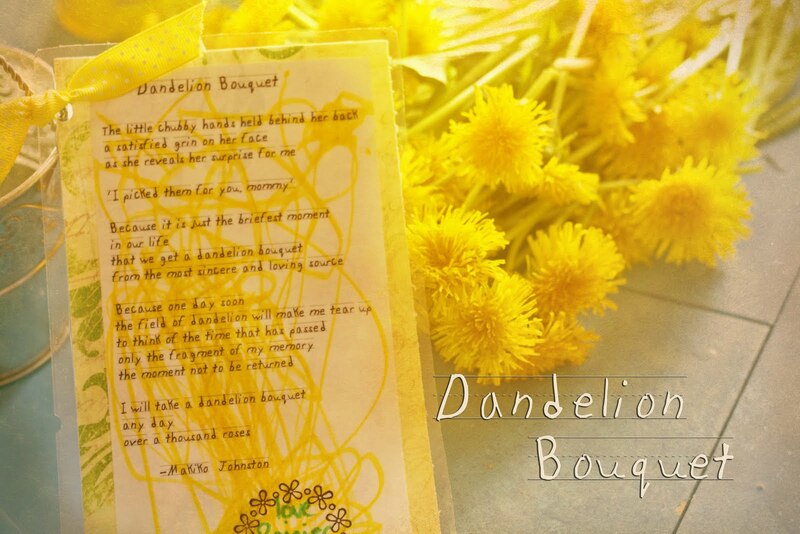 And then…all of a sudden…dandelion bouquets got all that much better. One of my friends posted a poem she had written. It’s just beautiful. 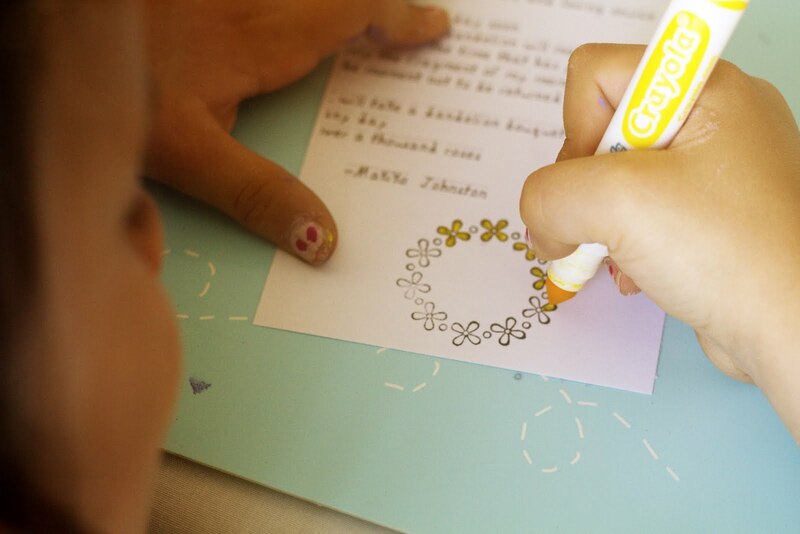 When I read it, I got goosebumps and as my son says, “my throat felt sad.” I asked her if I could use it in a craft for my day home kiddies and she said yes. Thank you Makiko! You made a bunch of parents smile. 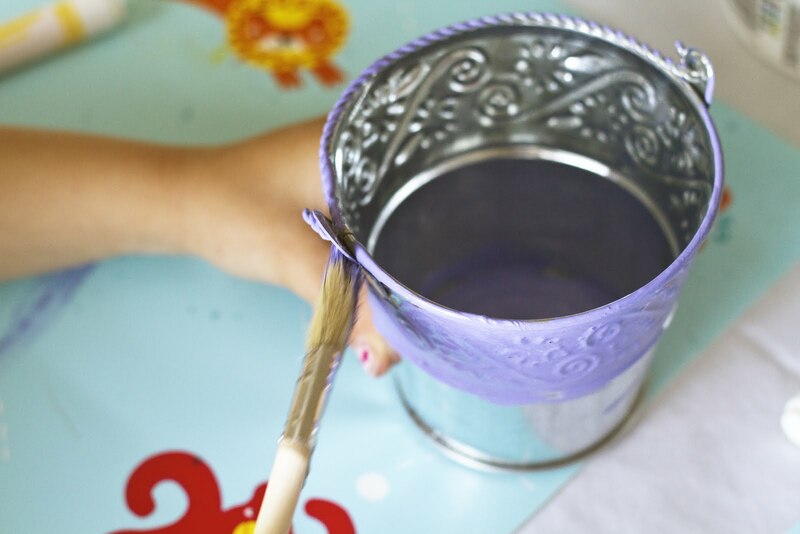 Give each child a bucket and let them get painting! 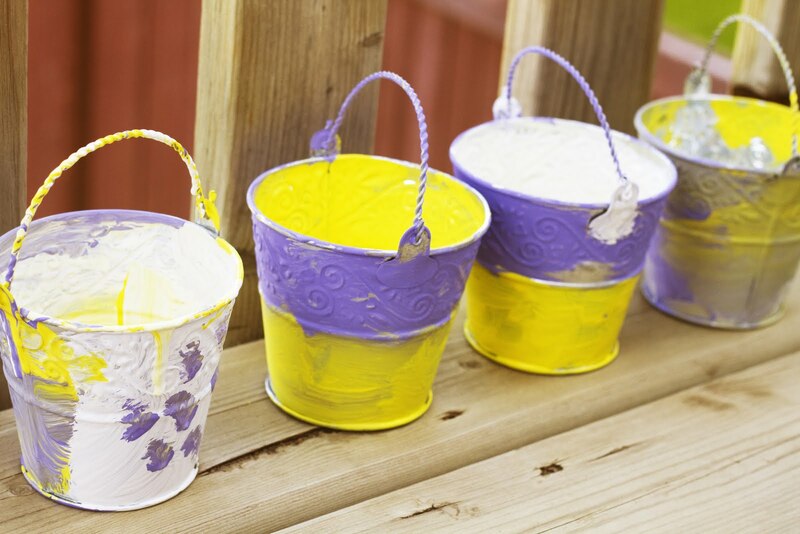 Set them outside to dry…this may take a couple of hours, so make sure you plan ahead. 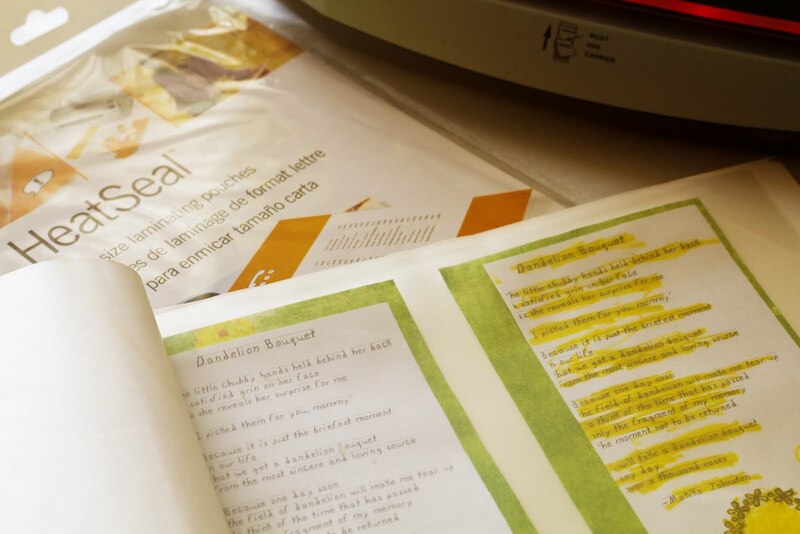 While their buckets are drying, allow the children to colour and stamp their printed copy of the poem. 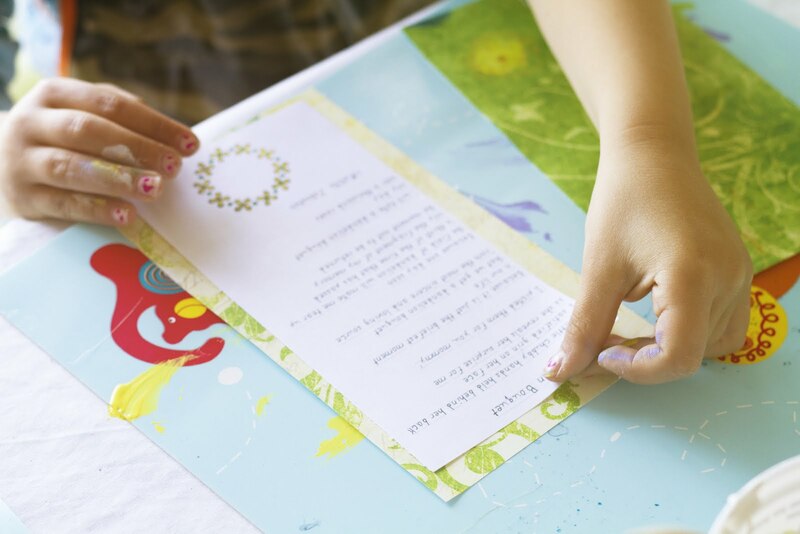 Then they can glue the back and mount it on patterned paper. I find that parents are more likely to keep things if they are laminated…well, I am anyway! So I laminated each poem. 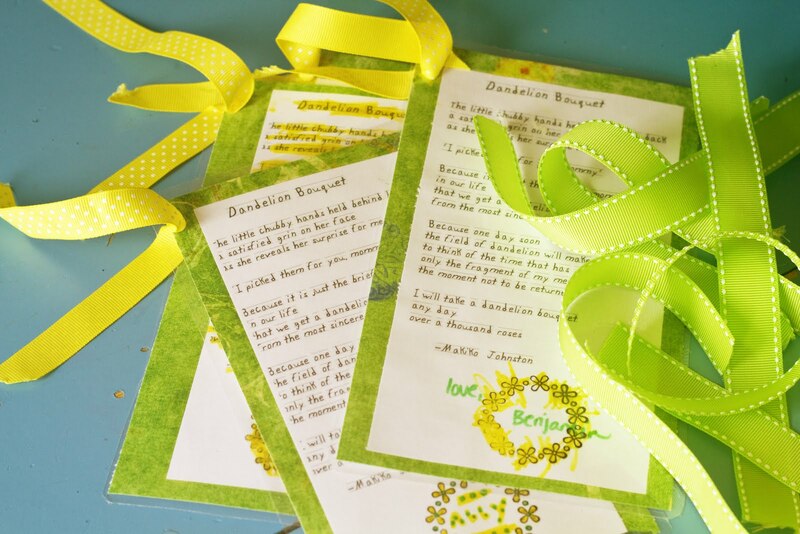 This way, the parents can use the poem as a bookmark later, or put it on their fridge. 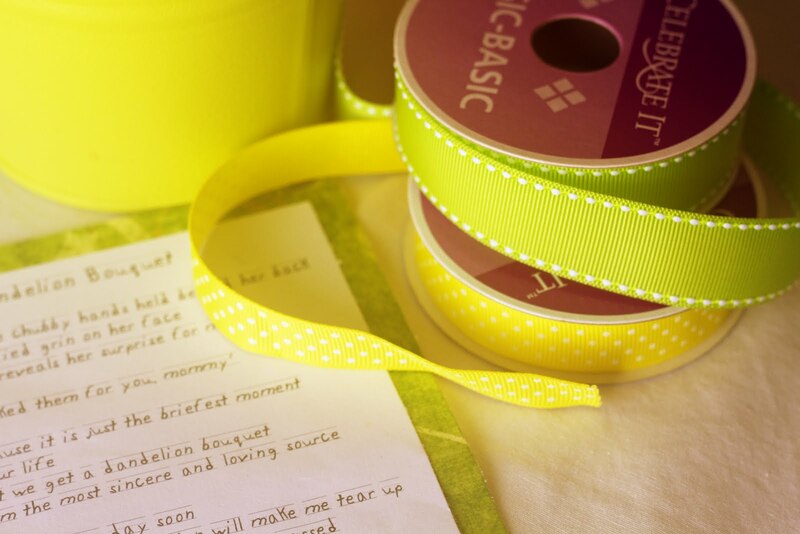 Cut 8 inch sections of ribbon for the top corner of each poem, And then 8 inch sections X 3 to tie on each bucket handle. Now it’s time for the sticky part! 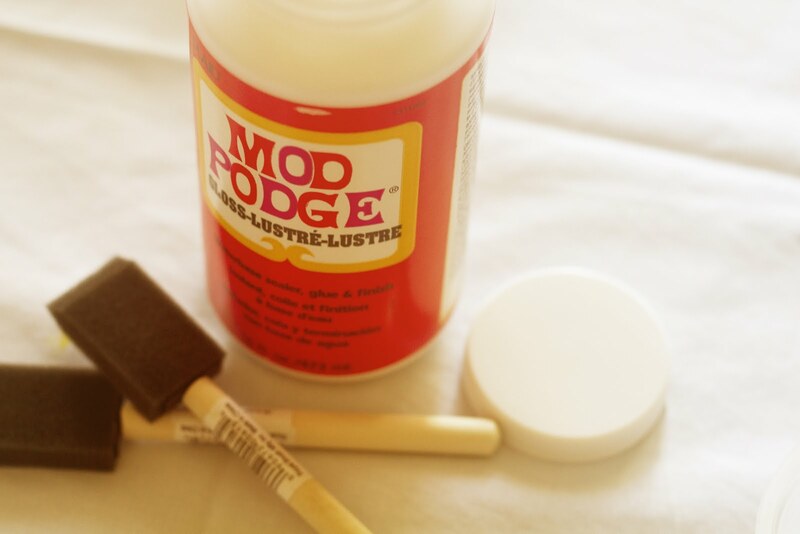 Break out the Mod Podge! They will be messy and glob it on all over the place. If you can’t handle it, don’t watch! Heheheh! And then when they are not looking, you can smooth out all the gloppy parts. Now, if you haven’t already, go out and pick some of those pretty yellow blossoms and fill your buckets up til they overflow. 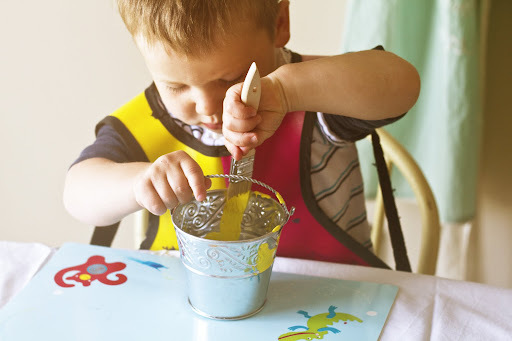 Add a bit of water, or let them wait until their buckets are safely home so water doesn’t spill on the journey. Seasons of dandelions will always be. But our little ones won’t. 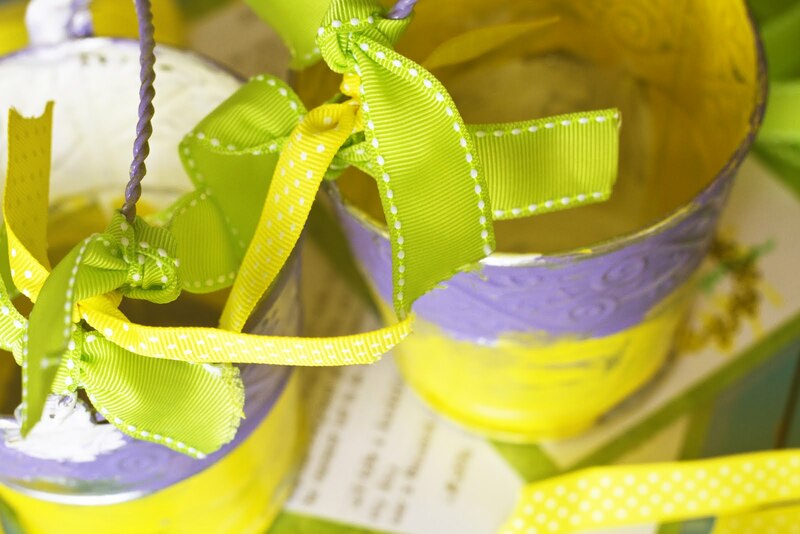 They will grow and like puffs on the breeze, they will be off in the world. I know I will treasure each and every bouquet I am given. Every fistful of yellow weeds will be as precious as the one before it. Thank you, Makiko for your beautifully crafted words. 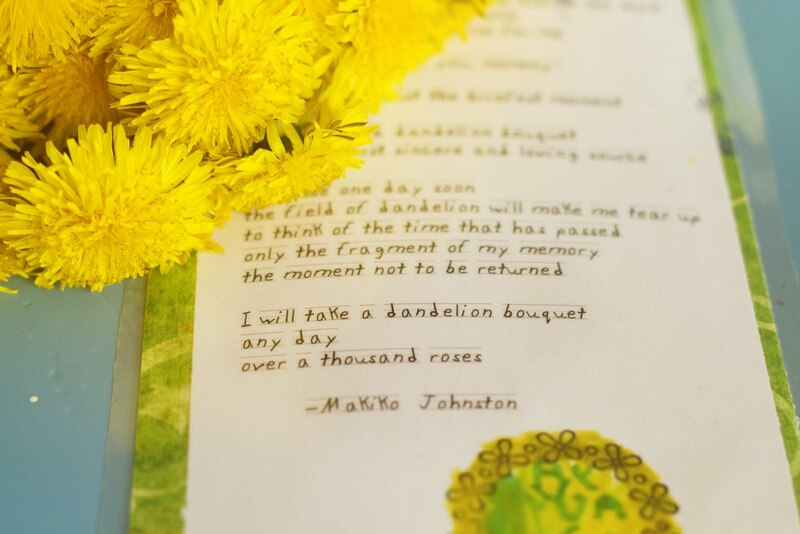 I really would take a dandelion bouquet any day over a thousand roses. Thanks for stopping by, and HAPPY FIRST DAY OF SUMMER!!! I teared up when I read this blog. 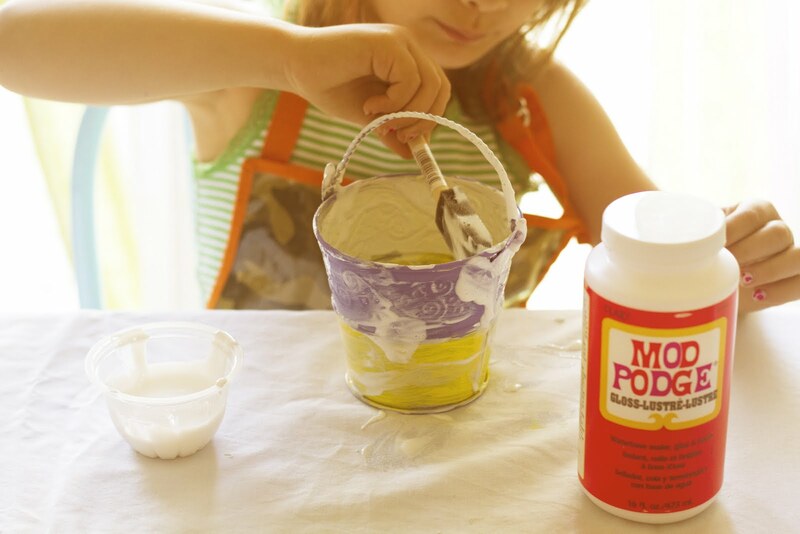 I miss the days when my children were small and they were at home with me and we were doing these fun things. You are amazing and it's so good to be reminded of the simple things in life that can bring us so much joy. Thanks for sharing and have a great first day of summer too! 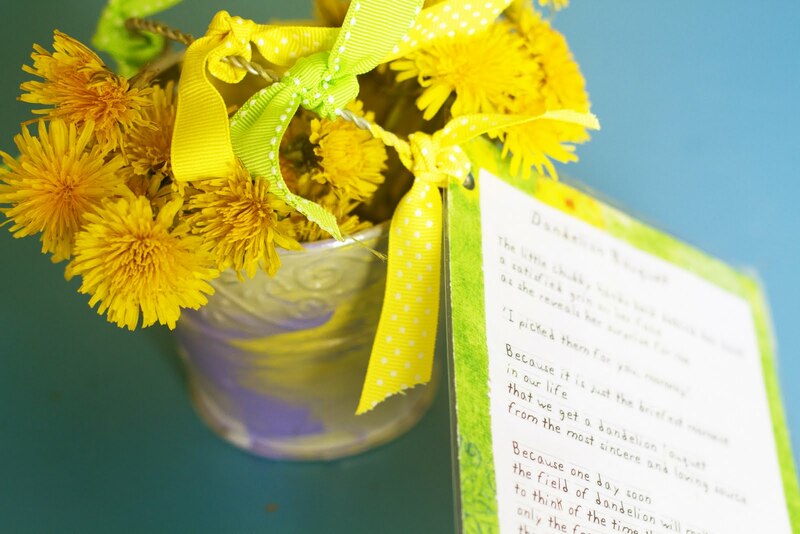 Beautiful post, my daughter gave me a dandelion bouquet every year and when she went away to university I really missed her but that first Mother’s Day she was away I woke up to a dandelion bouquet. She had called her father and made him pick one so now every year I can expect my dandelion bouquet and loving it. Thanks. 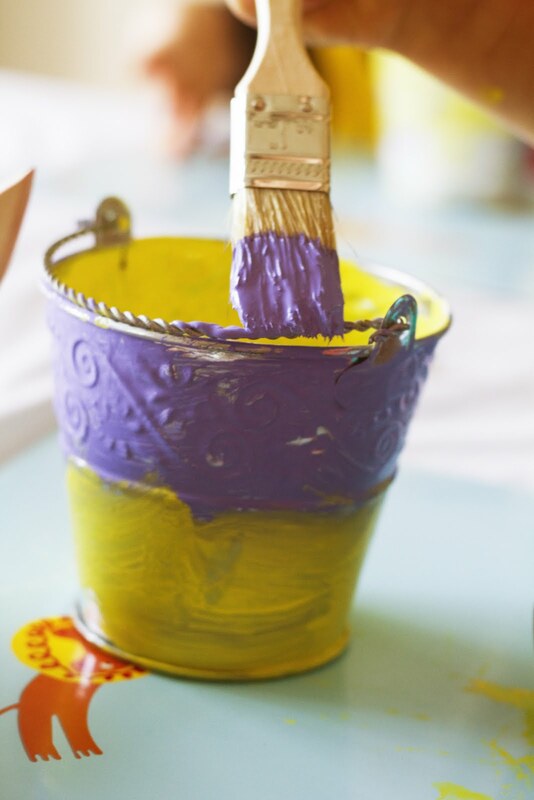 Such a fun idea… my favorite trick for sending flowers home with little ones, but still keeping them fresh is adding wet paper towel to the bottom of their vase- totally saves the spilling!